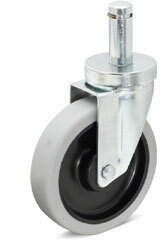 Heavy-duty industrial chair caster rolls safely on uneven cement floors. Non-mar soft tread is also safe for hardwood and tile floors. Heavy-duty industrial chair caster rolls safely on uneven cement floors. Non-mar soft tread is also safe for hardwood and tile floors. Also known as institutional casters or rubber casters. Body is constructed of galvanized steel with double ball bearings for trouble-free operation. Large 75 mm (2.95") wheel-diameter rolls easily on uneven cement flooring. Soft non-marking and non-abrasive tread is safe for hardwood and tile floors. Load capacity about 115 lbs. per caster. Universal mounting stem fits most, but not all, office chairs and task stools. Note: Installed height is 2.95". In some cases this will raise the height of your chair.